Leave vapor trails in the sky with this powerful stereo flanger pedal. The Mercury Flanger has three intense effect types. Classic mode offers a deep and dramatic effect in the style of the earliest flanger pedals. The Mercury’s Thru-Zero (a.k.a. “Tape Flange”) dramatically delivers the distinguishable twisting effect that occurs when the dry and modulating signals reach their intersection point. Finally the Shadow flanger offers a highly resonant yet silky smooth tone, with the jet engine “whoosh” all flange fanatics crave. 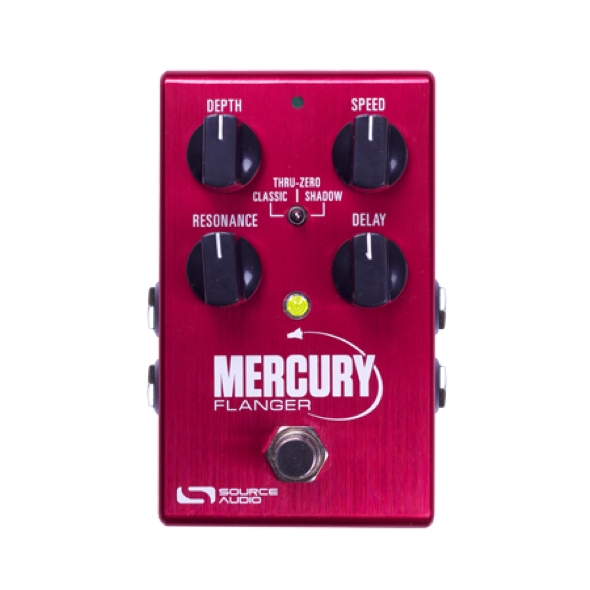 The Mercury also includes an on-board Delay control to explore that beautiful cosmic space between chorus and flanger. Out of the box, the Mercury Flanger offers tremendous tonal range, but beneath the hood resides the full power and flexibility of this dynamic stompbox. Every pedal in the One Series line is compatible with the Neuro Mobile App (a free download for iOS and Android). Link the Mercury to the Neuro App and access Source Audio’s free library of additional phaser, flanger, and chorus algorithms – each can be downloaded directly to your pedal. The Neuro App also offers an extended set of adjustable parameters including Wet/Dry Mix, Output Level, Tremolo, a Parametric EQ, Lo Retain, Advanced Signal Routing, and more. Plus, every One Series pedal is fully MIDI compatible when coupled with the Neuro Hub (formerly Soundblox Hub), giving you the power to save up to 128 presets. 2Stereo Input and Output Jacks — Create deep and wide stereo modulation or engage one of the Mercury’s many Signal Routing options (see Neuro App Features for details). 3Universal Bypass — Select either analog buffered or relay based True Bypass. 4Expression Control — Compatible with Source Audio expression pedals and the Hot Hand 3 Universal Wireless Effects Controller. 5Tap Tempo — Sync your flanger modulation rate to the rest of the band with Source Audio’s External Tap Tempo switch. Set beat divisions (quarter, eighth, triplet, and 16th) with the Speed knob. Connect the Gemini Chorus to the Neuro Mobile App (a free download for iOS and (coming soon) Android) and explore the power of effect downloading, customization, and sharing that comes with every Ones Series pedal. 1Interchangeable Algorithms - It is possible to download ANY of Source Audio’s phaser, flanger, and chorus algorithms directly to your Gemini Chorus for no additional cost. The same goes for the Lunar Phaser and Mercury Flanger, so owning one of Source Audio’s One Series modulation pedals is essentially like owning all three. 2Customize Effects — Tweak a vast range of additional parameters including Output Level, Feedback (a.k.a. Resonance), Tremolo, Modulation Delay, LFO Wave Shapes, Envelope Follower Mode, a Parametric EQ, and more. 3Signal Routing Options — The stereo Inputs and Outputs can be routed in a number of different ways including True Stereo, Mono to Stereo, Dual Mono, Sidechain Envelope, External Effects Loop, and more. 4Save and Share Your Customized Presets— Once you’ve fine-tuned an effect, save it to your personal effects collection and share it with the growing community of Neuro users. 5Download Presets — Explore Source Audio’s ever-expanding library of free effect presets. 6Simple Connection — The Neuro App. connects with the Gemini via the mobile device’s headphone jack and stereo Input 2 on the pedal. A Neuro App connector cable (1/8” to 1/4”) is included with the pedal. The Gemini Chorus also features full MIDI capability and simplicity when coupled with the Neuro Hub (formerly Soundblox Hub). 1Preset Saving — Save up to 128 effect presets (including phaser and flanger effects). 2Multi Pedal Scene Saving — Connect up to five One Series and Soundblox 2 pedals to the Neuro Hub and create 128 multi pedal scenes, recallable via MIDI program change messages. 3External Expression Control — Connect the Neuro Hub to any Source Audio expression pedal, Hot Hand 3 Wireless Effects Controller or third party TRS (Tip Hot) expression pedal and manually control effect modulation or assign individual or simultaneous expression control to any adjustable parameter. 4MIDI Clock — Sync your chorus modulation with external MIDI clock messages. 2Includes 1/8” to 1/4” cable for Neuro Mobile App connection. 4USB port — Connects to Mac or Windows PC for firmware updates and the forthcoming in-depth effects editing software.